Home automation is no longer the preserve of people like Bill Gates or the crew of the USS Enterprise. 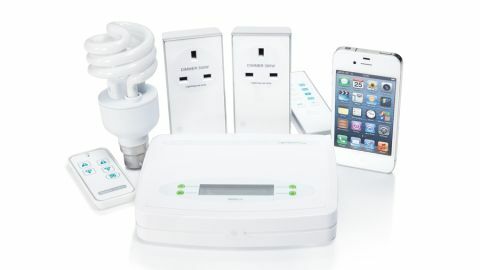 With the LightwaveRF pack, you can control domestic appliances and lights with just a touch of your iPhone. The set-up we tested included two plug adapters and a CCFL light bulb, all of which are controlled by the Wi-Fi Link base station. The individual LightwaveRF components use RF wireless to talk to each other, rather than Wi-Fi, meaning you need the base station in order to control them from your iPhone. Each component comes with a remote control, though, so they can be operated without an iPhone or the base station. Because the base station alone costs £70 (about AU$105, US$108), you're looking at an expensive initial outlay for the home automation kit, but the plug adapters and other add-ons aren't all that dear. Set-up is not a simple process. You need to read the instructions for each component, and then carefully navigate the slightly confusing interface in the iPhone app to get everything working. However, the plugs aren't as bulky as some of its rivals, so they're not as liable to block adjacent sockets if used in power strips. The app is not a pretty thing, and doing anything takes too many taps, especially when it comes to setting timers. The end results work fine, but it's about as beginner-unfriendly as it could be without bringing up a command line.